Handmade “Pepperoni Pizza” stud earrings. Sealed with a clear finish. Water resistant but not waterproof. Not recommended in the shower, pool, etc. Earrings measure approx. 8 mm x 9 mm. Our earrings are made with Titanium earring posts with Stainless Steel flat pads & Stainless Steel butterfly nut backs. They are Hypoallergenic and Nickel-Free. Perfect for those with sensitive ears, nickel allergies and those in Europe, where jewelry is legally required to have non-nickel findings. Our earrings meet the EU (European Union) Nickel Directive. Will fit 1 pair of earrings attached to card or multiple pairs of earrings not attached to cards (cards stacked next to earrings inside gift box). 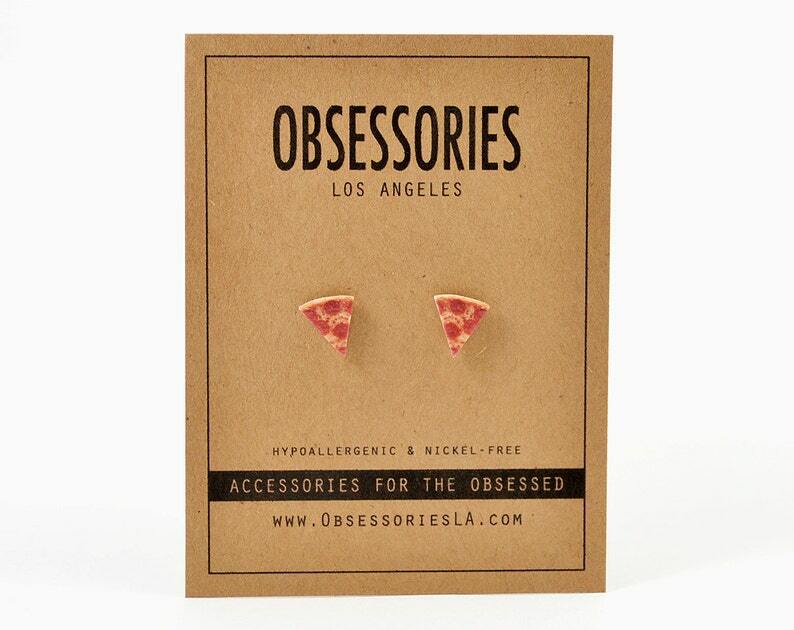 I ordered the Pizza earrings and am NOT happy with them. They look cheaply made, the color is not anything like the picture online and the quality of the earring isn't the best either. Lesson learned...I wouldn't order from this company if I were you! We're very sorry to hear you were unhappy with the earrings! They were made the exact same way using the exact same photo so they shouldn't look any different at all from the pictures in the listing. Color and brightness can vary slightly on different monitors but not an extreme amount. Sometimes buyers don't view all of the photos and/or read the description fully causing them to have different expectations. All sales are final. No refunds or exchanges. All our earrings are made to order. For this reason we do not accept cancellation requests. Orders returned to sender are subject to additional shipping charges to re-ship. All our earrings are made to order. Our current handling time is 3-5 business days. Large orders may take longer. We usually run ahead of schedule but some orders may take the full 5 business days. If you need your order by a certain date and are unsure if it's possible or what shipping method to select please contact us before placing an order. We ship via USPS First Class Mail. Priority Mail and Express Mail upgrades are available during checkout. Tracking will be uploaded to Etsy once your order ships. Express Mail Money Back Guarantee: If your package does not arrive by the guaranteed delivery date we will refund the shipping charge. Please Note: We do not refund the entire purchase price. Each additional item ships FREE! All items must be purchased in a single transaction to qualify. Our earrings are intended for occasional wear. They are water resistant but not waterproof. To ensure they last as long as possible make sure to remove them before showering, swimming, etc. We also recommend removing them before bed to avoid pressure/snagging. To clean gently wipe posts with a dry tissue. We accept custom orders! Message us for more info! We accept wholesale orders! Email us at obsessoriesla@gmail.com for more info! Our custom photo earrings are $14.95-$17.95. For best results choose a high resolution close-up that is well lit with no obstructions. Message us for more info! Our earrings are packaged in a small brown kraft jewelry box for protection. The earring cards are left outside the box. A gift note can be included for no additional charge.